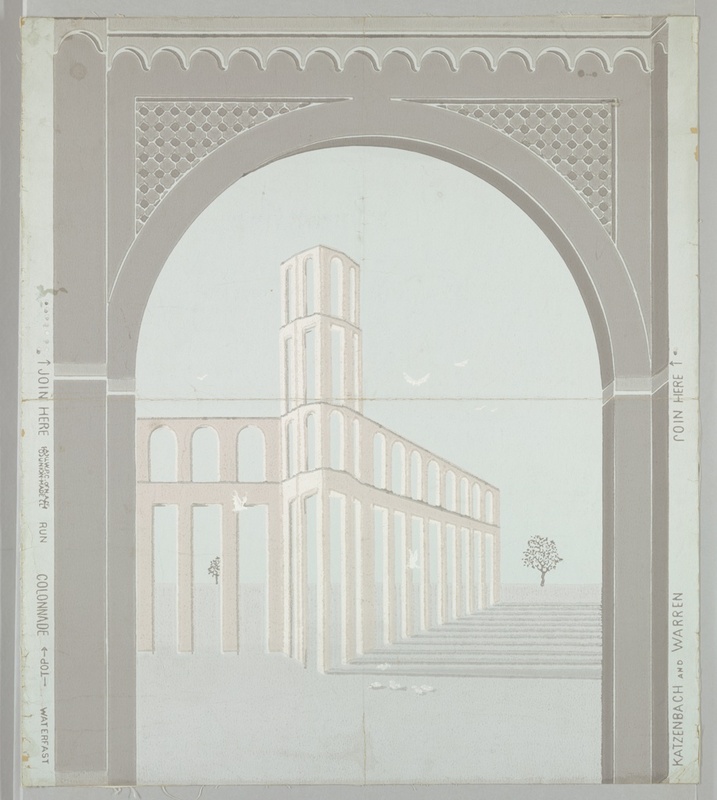 This paper has a decidedly modern look with the minimalist landscape seen through the arch. The view is bordering on surreal, centering on the ruins of a colonnade, with strong horizontal shadows going off to the right. Two trees are seen in the distance, with a flock of gulls or pigeons, which I initially thought were abrasions to the surface, seen in the foreground. This is the view seen through another colonnade, which in this single repeat, appears more like a triumphal arch. While appearing very modern this design has very old precedents. This is based on the pillar and arch papers that were popular in England from the late eighteenth century into the early nineteenth century. Based on a series of pillars and arches, each design contained a different scene viewed through the arch. Possibly because of the stately or classical stature of these papers they frequently contain political or patriotic views. Cooper Hewitt has two different colorways of Britannia, the personification of the British Isles, shown below in a terra cotta colorway. The museum also has two different pillar and arch designs, made in the USA, that pay tribute to George Washington, both produced within a year of his death. The other piece I’m illustrating has a very different take on this style. Still following the pillar and arch format, ornamenting the space above the arch are large vines with bunches of grapes, while a pile of sea shells and urchins is placed between the pillars. This paper dates to around 1800 with an unknown origin. Given the large repeat size and strong architectural nature of these early designs they were usually reserved for entries or up stair halls. Colonnade, meanwhile, with its smaller repeat and deep perspective, could visually enlarge a small space. ← Is there a Gothic Cottage in your Future?